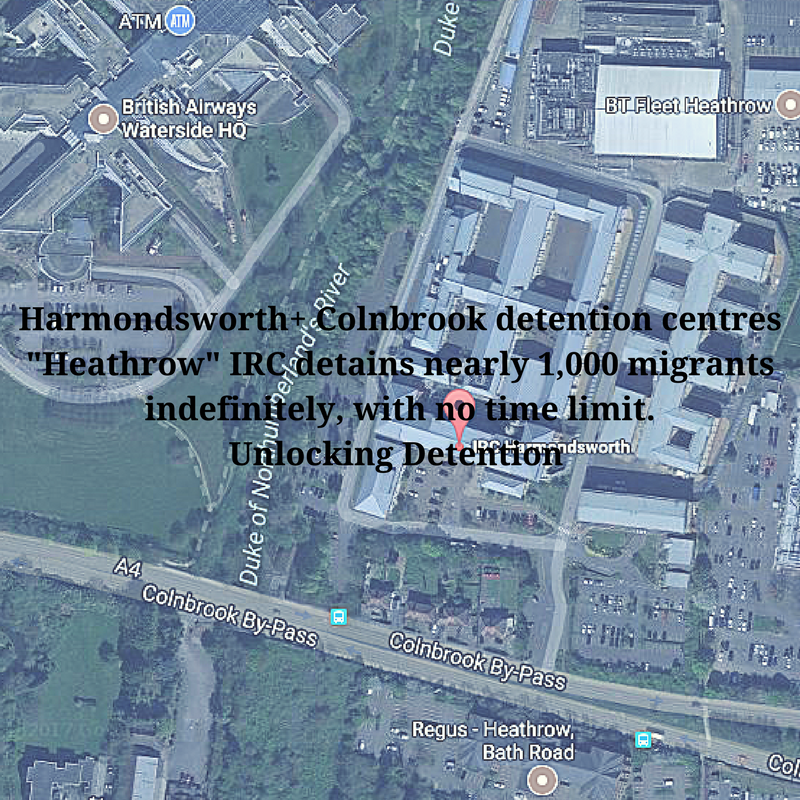 The seventh week of #Unlocked17 focused on Harmondsworth and Colnbrook: two detention centres alongside one another, a stone’s throw from the runway at Heathrow airport. Around 1,000 migrants are detained across these two sites. Harmondsworth alone has space for up to 661 men – making it the largest detention centre in Europe (yet another shameful record the UK holds, alongside being the only country in Europe without a time limit, and for detaining more migrants than any other country in Europe, except Greece). Harmondsworth and Colnbrook are both run by for-profit company Mitie: in 2014, they won a bid worth £180 million to run the two centres until 2022. This week also saw some encouraging news from Manchester in the campaign against immigration detention: scroll down to learn more! The report flagged the vulnerability of many of those in detention: in their survey, 80% of men said that they had had problems on arrival and nearly half said they had felt depressed or suicidal. They also highlighted the length of detention, noting that over half were detained in the centre for over a month. 18 people had been held for over a year, and one man had been detained on separate occasions adding up to a total of five years. This week’s first blog for Unlocking Detention came from Mishka from Freed Voices, who was detained in Harmondsworth. He sketches five guys that shaped his experience of Harmondsworth and continue to dominate his thoughts today, post-release. The five vignettes are called ‘Skeleton’, ‘Lifer’, ‘Blood’, ‘Brother’ and ‘Michael’. It’s a must-read piece, available here. Mishka watched his older brother, who had always been his strength and support, deteriorate in #detention before attempting suicide. "I had a hernia around this time and was waiting to go to hospital but they said they could not take me because all of the #detention officers were busy watching people on suicide watch. That has to tell you something". 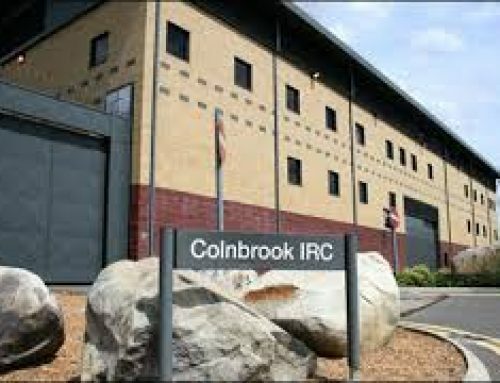 Neighbouring Harmondsworth is Colnbrook, a high-security detention centre with capacity to detain just over 400 people, the majority men. A Prisons’ Inspector report published in 2016 flagged the continued detention of vulnerable people and issues in the provision of care, noting, “Healthcare was an area of particular concern. Chronic staffing shortages affected the continuity and consistency of care. Care for those with severe mental health needs was generally good, but it was concerning that people with such severe illnesses were in immigration detention at all”. This week, we had an insider’s account of Colnbrook from Helen, a US citizen who was detained in Colnbrook for four days after travelling from to the UK to visit a friend. She wrote a detailed account of her experiences, documenting the injustice she felt and saw. You can read it here. As part of Unlocking Detention’s virtual tour of Colnbrook and Harmondsworth, we also heard from individuals involved in visiting these centres and challenging detention. First, Tamsin Alger, who has worked at Detention Action for ten years, looked back at actions taken over the last decade to challenge the injustice of immigration detention, including by people in detention, herself and her organisation, and at what’s changed in that time. She concludes: “So much has changed in the last ten years. The one constant is the devastating human impact that immigration detention has on people who are held indefinitely.” Read her reflections here. Beatrice Grasso is Detention Outreach Manager at Jesuit Refugee Service UK. With volunteers, she supports many detained in Harmondsworth and Colnbrook detention centres. In this blog, she explains how their mission “Accompany, Serve and Advocate” informs and shapes their work in these detention centres, ‘places most people don’t even realise exist’. Finally, we had a post from Candice Morgan-Glendinning and Dr Melanie Griffiths, examining the intersection of family life and immigration policy for families consisting of British or EEA nationals and men with precarious or irregular immigration status. We had some great news from Manchester this week, with the city council becoming the first in the UK to pass a motion condemning immigration detention. The full wording of the motion is here. Visit These Walls Must Fall to find out more! 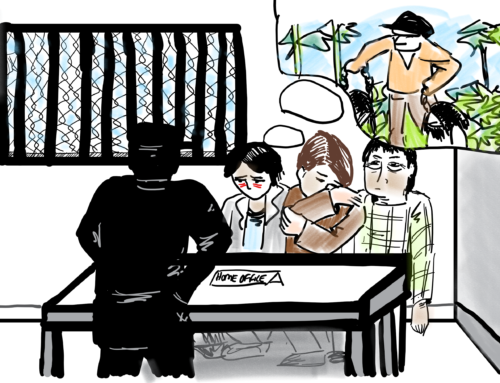 During the Unlocking Detention tour, why not speak out against immigration detention?